United have had a frustrating transfer window despite the arrival of three player Old Trafford this summer. Key transfer targets have either moved to other clubs or chose to remain in their current clubs which has left Mourinho frustrated with less than 18 days left in the transfer window. 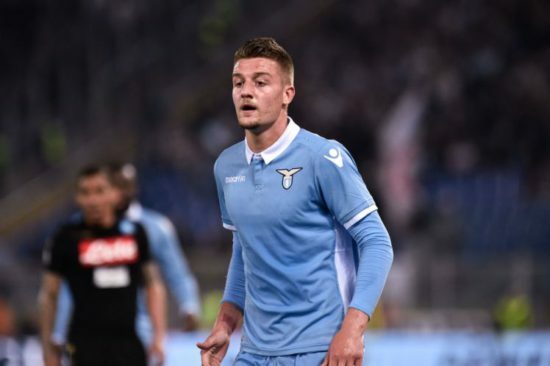 Serbian International Sergej Milinkovic-Savic appears to have joined this category as reports from Italy claims that the player has snubbed United in favour of Chelsea. Milinkovic-Savic has been linked to a blockbuster move to United as earlier reports suggests that United were willing to pay the £100 million asking fee demanded by Lazio. The Independent claimed on Tuesday that the 23-year-old midfielder prefers a move to Stamford Bridge, and also reporting that the Blues are willing to part away with the £100 million fee despite reservations about the player. However, the move hinges on the future of club talisman Eden Hazard. Madrid are interested in the Belgium forward and have tabled a bid of £170 million for the player. According to reports, Chelsea are unwilling to sell the player, but if the player leaves then Sarri would sanction a move for Milinkovic-Sarri. Milinkovic-Savic has developed into one of the hottest prospects in Europe with impressive displays for Lazio over the past two seasons.